Everyone wants to lose weight and feel great. Excessive weight gain can have a negative effect on someone’s self esteem. People who suffer from weight gain have many options they can try to help rectify the issue. Exercise, diet and stress relieving activities can help a person along in losing weight. Losing weight can definitely be quite a challenge. Losing weight from different parts of the body like the stomach and the legs can be even more difficult still. There are several things you can try to help alleviate the problem of fat. Fat tends to collect in areas like the thigh, hips and above the knee. Make a change to your everyday eating habits. Change your diet as you need. Lower your salt intake. Eating a healthy diet is is imperative to meeting the challenges of losing weight. As a general rule of thumb, keep in mind that you need to burn more calories than you eat. You should increase your intake of foods high in fiber, low fat, fresh fruits and vegetables. You also should avoid as much canned and processed food as much as possible. Foods and snacks that are high in sodium should also be eliminated. Check the food labels to see how much salt is in the food you are buying. The daily amount of sodium should be limited to 2400 mg a day. Start to exercise. You need to do strength straining up to three times a week. Do exercises that target and work the legs. Lunges, squats, calf raises and leg lifts can also help move the fat. Your legs will begin to slim down and get toned. The best way to go about this is with a personal training. They can help you with techniques and keep you safe from injuries. Increase your cardiovascular activity. 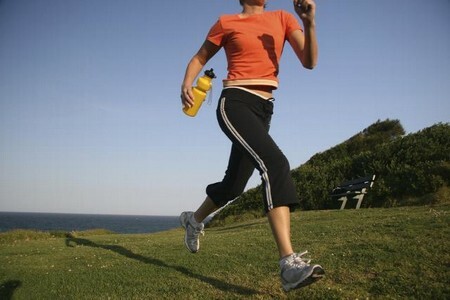 You should participate in cardiovascular exercise for 45 minutes 4-5 days out of the week. These exercises can be done whether they are low or high impact. You can walk, run, jog or ride a bike. Even using a treadmill can help you. Trampolines help reduce the shock to limbs so this may also be a great option for you. Incorporate more movement into your life. Get some form of exercise daily. Walk the dog, walk to the store as opposed to driving. Take the stairs instead of the elevator. These can all speed up the weight loss in your legs and around the knees.